Horse Mango scientifically known as Mangifera foetida is a species of plant in the family Anacardiaceae which is commonly found in wet-land rainforest regions of Indonesia, Malaysia, Myanmar, Singapore, Thailand, and Vietnam. 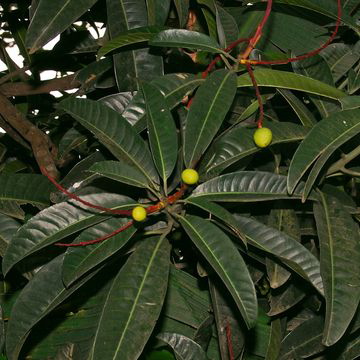 Other Popular common names of the fruit are Bachang, Gray bacang, Grey bacang, Horse Bacang, Machang, Bacang, Grey mango, Limus, Mamut, Macang, Pahu, Svaay sââ, Thayetpoh and Xoài hôi. If you ever see the shape of a mango, you certainly will not feel strange with these horse mango fruit shape, because this fruit belongs to the family of mangoes, although having the same shape, but this fruit has a different flavor. The fruit is edible. However, young fruits extrude sap that may cause blisters. Mature fruits have a strong smell. 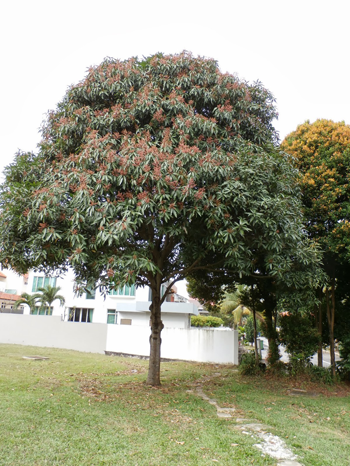 Horse Mango is a densely-crowned, evergreen, perennial, deciduous tree that can grow up to 40m tall. It has straight bole (Trunk) that measures about 100 cm in diameter and buttresses are absent. The surface of the bark is light brown to dark greyish brown and shallowly fissured that contain a caustic whitish sap, massive branches and a dense crown of shiny dark green foliage. The plant occurs mainly in primary lowland forest in the hot wet tropics from near sea level to 1,000 m altitude. The species is modified to areas with abundant rainfall, consistently distributed over the year. The plant prefers any well-drained soil of pH 5.5 to 7.5 of moderate moisture and avoids wet soils. Deep soil is better because of extensive root systems. Leaves are elliptic-oblong to broadly elliptic, sometimes oblanceolate, 15–40 cm long and 9–15 cm wide, rigidly coriaceous, apex obtuse or slightly emarginate, base cuneate or attenuate, more or less bullate between the15 and 33 pairs of nerves. Petiole is 1.5–8 cm, stout, swollen at the base. Panicles terminal to sub terminal, upright, pyramidal, 10–40 cm long, sparsely branched, rather densely flowered, deep reddish-pink, inflorescence axes stout, deeply red. Leaves are dark green above and light green below. The inflorescence is pseudo-terminal, pyramidal and usually hairless. 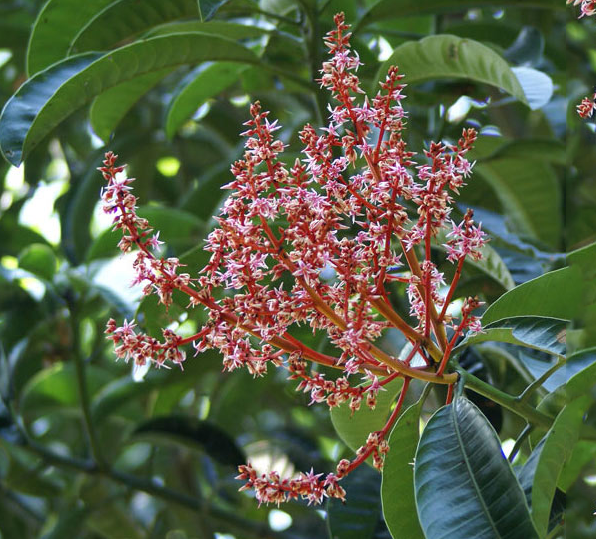 The flowers are 5-merous, with petals 6-10 mm long, pinkish, violet ­red at the base, with whitish apex and with a broad short ridge on the inner surface at the base which is split into 3(-5) branches. The disk is stipe-like and short, with one fertile stamen (rarely two) and connate at the base with 2-4 unequal staminodes. Fruit is obliquely ovoid-oblong or almost globose drupe, 9–16 cm × 7–12 cm and up to 14 cm in diameter. 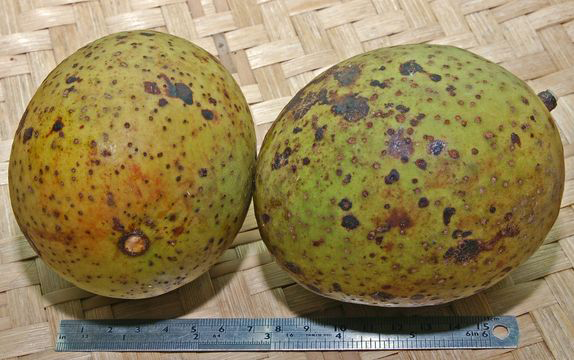 The fruit is glossy yellowish-green while young turning to dirty dark olive-green or dull yellowish-green with brown lenticels & spots when ripe. The fruit skin is 5 mm thick. Flesh is pale yellowish-white when immature turning to yellow or golden yellow when ripe. The fruit is fibrous, juicy, savory, with strong smell of turpentine. The single seed is surrounded in a woody capsule in the center of the fruit flesh. 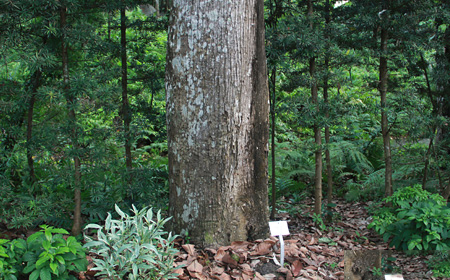 M. foetida is endemic to the dipterocarp forests of Peninsular Malaysia, Peninsular Thailand, Sumatra, and Borneo. It was also collected apparently wild in Java. It was introduced to south Tenasserim (Burma), where it is popular. It is widely cultivated in its area of origin. In Vietnam, Cambodia and the Philippines, it is hardly cultivated and virtually unknown. Today it can be found in several parts of the world due to its amazing taste and health benefits. 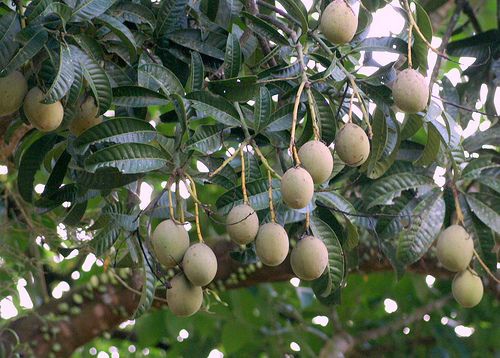 Horse mangoes are rich in iron, so they are quite beneficial for people suffering from anemia. Frequent and sufficient consumption of horse mango helps to avoid anaemia by increasing the blood count in the body. They are also very beneficial for pregnant women as a natural source for iron, an essential mineral. 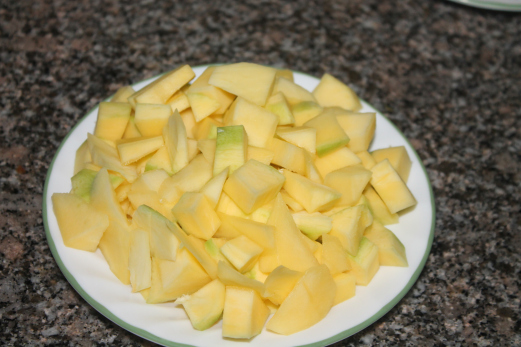 Horse mangoes consist of wonderful amount of soluble dietary fiber called pectin. The pectin decreases the action of a protein called galectin that is present in cancerous cells and plays an important role in cancer. Possibility of cancer in the gastrointestinal tract can be decreased by the intake of fiber. 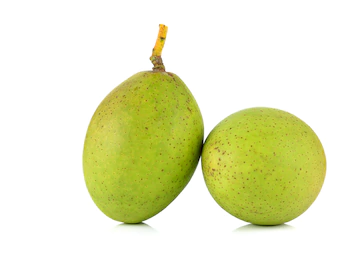 A compound in mangoes, known as lupeol is said to suppress the tumor cells of prostate cancer. Abundant quantities of beta-carotene, a carotenoid can be found in Horse mangoes. This element helps in increasing and strengthening the immune system. Vitamin A is an antioxidant and offers protection against the uncountable free radicals that can harm your internal system. Horse mango consists of huge amount of pectin, a soluble dietary fiber that competently lowers the blood cholesterol levels. It also prevents you from having prostate cancer. 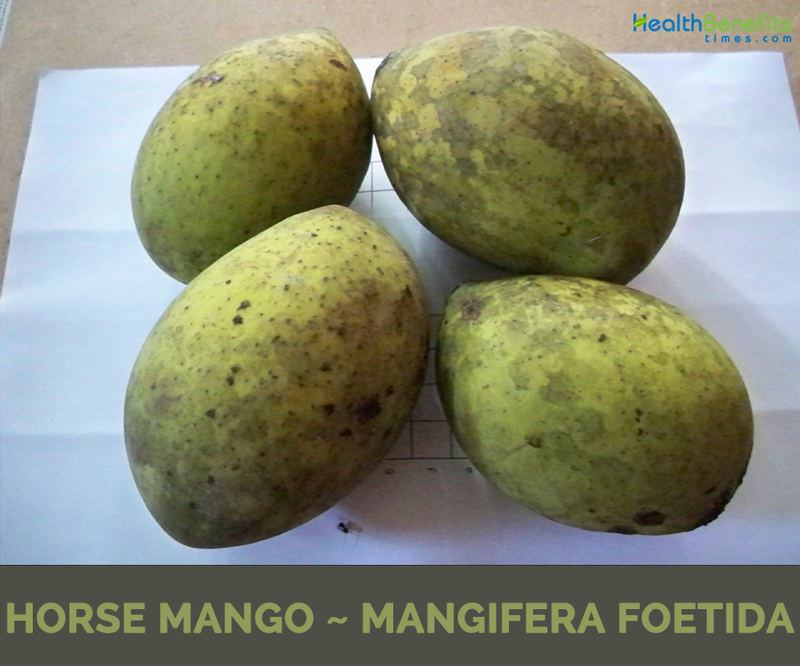 Horse mango contains an enzyme which is considered to help in digestion. Esters, terpenes and aldehydes are some of the bio-active ingredients present in the horse mango, which are said to increase appetite and also improve digestion. Consuming a mango after a meal helps remove problems like indigestion and acidity. Horse mango is related with skin beautification, and is used as an ingredient in face masks, particularly freshly homemade ones. Other than bringing a glow to your face, this fruit also helps to lighten skin color. It can also treat acne effectively as they open the clogged pores of the skin. Horse mangoes have abundant quantities of vitamin B6 for maintaining and improving brain function. These vitamins help in the amalgamation of the major neurotransmitters that contribute in determining the mood and modification of sleeping patterns. Glutamine acid content in it improves concentration and memory power. Leaves are said to be antipyretic in folk medicines. 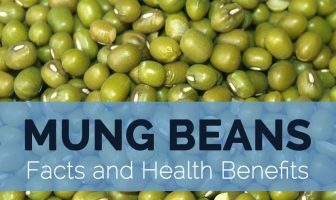 Seeds can be used against trichophytosis, scabies and eczema. The Orang Asli in Peninsular Malaysia reportedly used the sap to deepen tattoo scars. Sap from bark is used in lotion for treating ulcers. 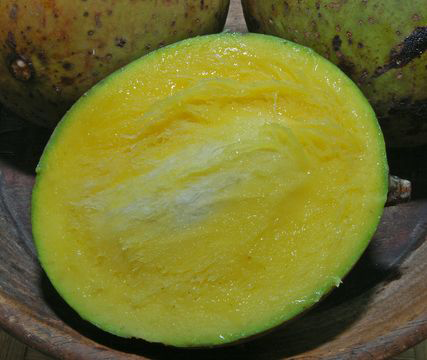 Pulp of ripe fruit is rather savory and has a strong pleasant turpentine odor and is eaten fresh. It is also excellent as component of fruit cocktail. Fruit is also used in curries or as pickles. Unripe fruit, washed in salted water and sliced is used in vegetable salads and in a sour pickle. Fruit commonly replaces tamarind as an acid ingredient in the preparation of sambal in Borneo, especially in East Kalimantan. It is used to make chutneys, sambal, acar, rojak and jeruk (green pepper with lemon) as well as pickles and in curries in Malaysia. Grated seed, with the addition of oncom (Monilia fermented soybean), sugar, tersai (fermented fish) and salt is used to make a sambal known as ‘pelok limus. Wood is not durable, but is suitable for light indoor constructions, temporary constructions and plywood. Streaked heartwood is suitable for the manufacture of furniture. Sap is used in tattooing. It is used to deepen tattoo scars. In a fruit bowl, mix 10 slices of cucumber, 10 bite-sized pieces of pineapple, 10 slices of mango, 3 chili padi sliced and juice of 1 horse mango. Mix and add salt and pepper to taste. Delicious horse mango fruit salad is ready to serve. Juice of the unripe bacang fruit is considered poisonous and can irritate the lips, mouth cavity and skin.